Clasp your shawl now - your beach sarong later - here's the next in our Charmed Life series to do it with! A stunning doubly-terminated rock crystal is wire wrapped to a handcarved bone rabbit...to a mellow amber horn round. The meticulously carved Mali wood Buddha to smoky topazes and lucky bronze coin. And since it was the rabbit's EYE considered lucky and protective, a carved rabbit's head bead with smooth horn and leopardskin jasper chain-links to the other players. 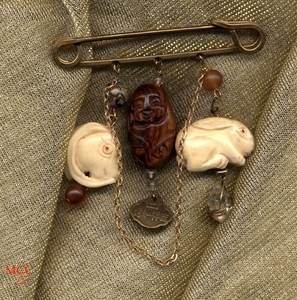 2 1/2" wide by 3" tall to safely pin you together...you're elegant and swift...like a bunny.